For most Americans, the day after Thanksgiving is known as Black Friday, a day dedicated to shopping, a day to take advantage of one-day only deals. It’s become controversial through the years, as customers crowd the stores and trample one another for cheap electronics and consumer goods. Few can argue that it’s anything but crass. I follow The Compact, and thus buy only used; although frankly at this point I hardly buy anything beyond consumables and the occasional second run movie ticket. So yeah . . . I won’t be pitching a tent outside Best Buy as soon as the Thanksgiving leftovers are put away. My problem with Buy Nothing Day is that, like Black Friday it’s a one day event. Buy nothing this one day, but then shop normally the other 364 days. Yes, it gets people talking about our consumer society, and that’s a good thing, but it’s still just one day. Buy Nothing Day should be replaced with 365 days of conscious consumerism. An entire year where consumers citizens make deliberate decisions about the purchases they make and how those purchases effect this world we live in. Only buy products that are produced by companies that provide their employees a living wage and safe working conditions. Companies who do not engineer planned obsolescence into everything they manufacture. So yes, go ahead and choose to buy nothing on Black Friday if that’s your inclination, but please don’t think that can shop with abandon the other 364 days just because you abstained for that single day. Shop deliberately. Shop thoughtfully. Shop responsibly. Shop less. I see it as a tiny step for our hyper-consumerised world. Remember, we are currently but a fraction of the masses. To win them ( at least the few who will eventually see the light) over to our side will be a war against consumerism. Black Friday is just a battle! My 9 year old recognizes the insanity-especially surrounding the holidays. “Mom, I’d tell you to avoid Target as a protest, but you refuse to go there anytime!” The kid knows his mom!! I stopped the black Friday thing years ago when I realized the deals weren’t as good as all the commercials made it seem. I don’t shop for Christmas in an actual store anymore at all. What I perceived as my needs has also greatly changed over the years. Spending time with my family trumps spending time getting run over by strangers on my day off any day. Well said, Katy! Since I began following your blog, I no longer get much enjoyment from buying anything beyond food and the occasional book. I was never a major shopper,but now when I am in a store and perhaps tempted to buy an item, I can almost project a few months into the future when I am giving that item to a rummage sale or donating it to local Goodwill. I guess as you get older, you just don’t get that excited about “stuff”. I have to admit that I am still into home maintenance and am very fussy about my house, especially because we will probably be selling in a few years, and i try to keep it in good condition. But even there I find I can “talk myself out of” the random painting, new carpet, etc. I only do “Que Cera, Cera” shopping on Black Friday. I look through all the ads and choose the small handful of things I want/need to buy on sale, then go out about 10 am and see if they’re still available. If they are, cool – I’ll buy them. If not – “Que cera, cera”! And some yrs, there hasn’t been anything worth giving up lounging around in my PJs snacking on leftovers! We do the same thing, and it’s usually at Lowe’s or Home Depot, so there’s not huge crowds. We get coffee and keep it casual. I don’t even try to get any of the super deals, they are always gone first thing, but there’s usually some little things we want or need that we get a good buy on that’s still hanging around mid morning. Like Sherri, I have never been a big shopper, and I think much more before I buy something now. Sometimes my husband will say, “we should get so and so” and now I respond “that might be nice” and usually that’s the end of it. If we don’t enable each other, we rarely buy anything. The past few months though have been trying as it has been one thing after another that costs money – illness, car repairs, home repairs, etc. Excellent blog Katy! Treat Friday as any Friday and be mindful all year. When polling our extended family last year at Thanksgiving, only one of my sons intended to participate and this year even he isn’t as enthused as usual. I usually visit Home Depot in the afternoon for their half priced Xmas wreathes which I gift to my older son. That accomplished, I am finished for the day. By the way, in the afternoon, there were no crowds to speak of! About half or more days of any given month are Buy Nothing for us. I don’t like traditional shopping at all, and since leaving my awful job in the spring, we’ve converted to necessities only buying. Now, I do enjoy an amble around a thrift store, but there’s no pressure to buy and if I don’t find what I’m looking for, there’s always another day to drop in. My Frugal / Buy Nothing advocacy this week was sharing my theory that families do better when the focus isn’t on buying new things as soon as they’re available but rather enjoying the things they already have to the fullest and selling or donating excess things to people who have little and would greatly appreciate them. Other than groceries and occasionally toiletries there is not much I buy these days. I do sometimes hit Home Depot on Black Friday, mid-morning, when they have poinsettias for ~$1. They make up much of my holiday decorating and it’s nice to have some to give away. These days when I see something is made in China I just leave it at the store. The environmental damage caused by our hyper-consumption is not something I choose to support. The Black Friday sales seem to be focused on TVs and other electronics. I have no need for a new laptop, tablet, phone or TV so I do not pay much attention to Black Friday sales. I have learned that I enjoy Christmas more when I don’t try to find the perfect gift for everyone. However, sometimes I do go to Fred Meyer’s mid-morning and buy socks for my husband and son. These are always appreciated because both DH and DS are hard on socks. So the sock sale at Fred Meyer’s is the only thing which tempts me on Black Friday. My daughter, when she was about 20, said “did you know there is this whole Black Friday thing?”! Now 8 years later, we still don’t shop Black Friday. We buy few things new as a rule – trying to empty the house not add more. I do check the ads but there is never anything that will take me out of the house that – as someone else said- means I’d have to change out of my pajamas. I do shop on Black Friday. But, only for one thing. Every year Fred Meyer has all their socks for half price. since both my mother and I have to wear diabetic socks, and they are dreadfully expensive, I get enough for us for the whole year at that time. then I drink their juice, eat their donuts and go home. That sounds weird that I wear diabetic socks and then eat donuts. I am not diabetic, but I can’t have socks putting pressure on my ankles. The diabetic socks work great for that. Even diabetics can have a occasional donut if they plan appropriately. 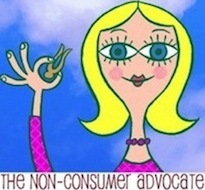 Non consumer advocate is a judgement free zone so no worries, lol. The mere thought of Black Friday shopping gives me the vapors. Although I did love the day when I was 18 – 20 years old waitressing at a restaurant in the mall. Made good tips that day! It’s a zoo around the mall in my area and all the other big box stores are in the same area. I’ll stay home and enjoy that second piece of pie. I bought some new shoes this past weekend and am still traumatized by the act of going into the store! I wear my shoes OUT so I generally buy new (underwear too but for different reasons LOL). I can’t imagine going near the store during Black Friday — my family takes a hike if the weather is good — if not, we rent movies at home. And Black Friday? I remember a few years ago I spent a couple of hours waiting in a checkout line and it was so awful. Don’t even remember what I got. I have absolutely no qualms with missing out on that kind of excitement. Black Friday is probably the day most full of annoyances and buyer’s remorse and best suited to spreading the word that there are other options. Once people feel the freedom from that pressure to buy more and more, some of them won’t want to give it up. For 20 years my whole extended family spent Thanksgiving and then Black Friday at a state park in West Virginia. We had cabins next to each other and took hikes all the days we were there. Stores and the hype of Black Friday was so removed from all of us. Over the years the kids stopped coming for various reasons and then the adults stopped coming. So this is the first year the rest of us will not be going. I will not know what do with myself being in the real world on Black Friday for the first time in over 20 years. Sad for you that such a wonderful family tradition is ending. I hope you can discover a new one over the holidays to come. How do you find “companies that provide their employees a living wage and safe working conditions. Companies who do not engineer planned obsolescence into everything they manufacture.”? Always interested in more resources to help be a better consumer when it is necessary. I was wondering the same thing. A post idea for Katy? For me, it’s Boxing Day (December 26th). I used to be one of those waiting in line to “get the best sales”. Then I realized that it’s a waste of my time and money. So I stopped. And I generally go to the store only when I really need something. Not to pass time, not to cheer myself up, no to follow the tendencies. I dislike shopping, hubby dislike shopping, so it’s quick. And I always prefer to look for used prior, if possible. Actually, my employer does not give us the Friday after Thanksgiving as a holiday, nor do they give us Christmas Eve or New Year’s Eve, or Good Friday or…. Anyway, I use a vacation day for those days or work over to have comp time, so I take the days off. I tried Black Friday once years ago and swore never again, however, my daughter has developed a system on Black Friday that actually is fun, so now I go with her, for Christmas gifts only, and with a strict list. We skip the huge crowds and go when the rush is over — if we find the gift, we find it, if not, oh well, but usually, we find it. Some sales are great, some not so great, so it helps to know the regular price beforehand. We spend a few hours, have a good time with each other, never wait in line more than a few minutes, and get a lot done. That said, I do shop mindfully, and buy things like quality toys made from recycled wood and items made in the US. And I’ve made it known that I don’t mind a used or hand-made item, and I’ve given some most years as well. I would like to see the consumerist ideology gone as well — the 1980’s and 90’s seemed like consumerism was the god of the decades — but I recognize that some buying will always have to go on. In the past few weeks, I’ve made a conscious decision to buy less. Actually, my goal is to buy nothing for myself through the end of the year (including my kryptonite: holiday décor). I brushed show from my car today with my broom, wearing socks for mittens, because I truly believe that I can make do without. I don’t NEED everything I see, or everything I want to buy in the moment. I NEED to be content with what I have. Here’s to non-consumerism as a lifestyle! The thought of shopping on black friday is like nails on a chalkboard for me! I went once about 15 or so years ago, stood in line half the night and when they finally opened the doors I was so overcome with panic I turned around, got in my car and drove home. (Friend and I did not drive together) Then I went to bed and pulled the covers over my head as if it had all been a nightmare. Certainly reading Katy’s blog has helped me become more aware and thought consious about my purchases, but it does help that I hate to shop. Still, I have room for improvement. Superb post — very well said. Thank you, Katy! I loathe any type of shopping that weekend especially, even grocery shopping. So, I stock up on groceries the week before and we enjoy a a fun, family weekend. When I do shop, it’s usually during the week, on my lunch break and it’s conscious purchases for food or things we need. No Christmas shopping rush for me. The things I get my daughter and grandkids are specific things they need or want, bought throughout the year – many times they are good, used items bought at thrift store, hand made by a friend or bought at a pawn shop. Christmas break is a fun, family week of vacation. Shopping is not a sport or a hobby for me, it’s a chore. One I avoid, if at all possible. I want to barf every time I see the commercial on TV in the US now where an affluent looking wife talks to her husband about how the inlaws are coming for Thanksgiving and they have to buy a new rug, a new bedding set, a new dining room table and chairs, a new this a new that, bla bla bla. It really does boggle the mind that there might be people out there who spend money like that ‘just because its the holidays.’ I despise these types of holiday ads most of all. Seeing these ads actually makes me want to do the opposite of shop–but with age comes maturity I guess! (and the appreciation of a large savings account)!